So… I seem to be watching these movies backwards; though I’m not sure I’ll be watching the first three. It’s good that this movie starts off putting the viewers straight into the action. There are some good elements of comedy in this, particularly where Benji is involved, but the movie doesn’t really let up on the action. It’s clear almost from his first appearance that there’s some tension with Brandt towards Ethan. Even though Brandt is technically an analyst, he shows himself to be more than capable during the course of the movie. Plus, he clearly feels a lot of guilt for what happened in the past… and that’s a good way of adding depth to a character. I liked seeing the IMF forced to work together, even though there were problems. The technology used was pretty cool, such as the holographic wall and the glue gloves… the latter being the most terrifying to watch while being used, considering Ethan was attached to the side of a building. It was interesting to see the team have to set up two separate meets and figure out how to play the two ‘bad guys’ off against each other. It was disappointing that they couldn’t make use of the masks… but it was still good to see them using their skills in the mission. There were a lot of tense moments in this movie, as well as the afore-mentioned gloves scene. There was also a pretty good scene where Brandt admits what’s been affecting him… what he’s been hiding. I recognised quite a few of the actors in this movie and I thought they played well off each other. The characters were likable and humour was used at the right times to lessen the tension. 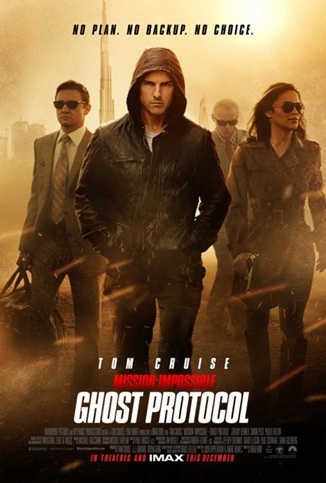 It would be cool to see a sixth Mission Impossible movie in the future.